For those who like to golf, you have come to the right place! 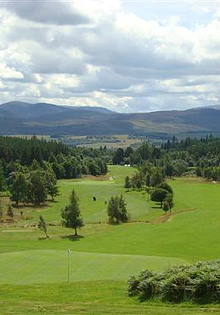 There is a great choice of golfing options available, with the closest courses being Kingussie and Newtonmore, yet within a short driving distance you will find a selection of truly amazing courses such as Boat of Garten, Grantown-on-Spey, Spey Valley, and Carrbridge. Further afield you have Castle Stuart, former home of the Scottish Open, and the world renowned Royal Dornoch (approx 2 hours) which has been consistently voted as one of the top courses in the world. We do recommend advanced tee booking prior to your arrival and as such it might be a good idea to make direct contact with your chosen venue once your booking with us is confirmed.